Download five simple tips to make the most out of your recognition efforts. Print and post them in your workspace as a reminder, and share them with other managers. Customize Your Appreciation! 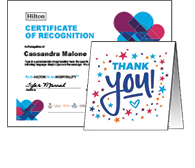 Choose from a variety of certificates and thank you cards to recognize Team Members for the unique contributions that they make. Simply download, type a personalized message, print, and present! All content is customizable, including language. Choose from multiple options. Customize, print, and present. 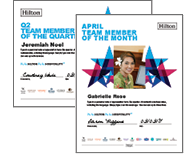 Recognize Team Members who live our shared Hilton Values. Use these to supplement your existing efforts. 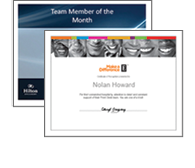 Recognize a Team Member of the Month, Quarter, or Year. 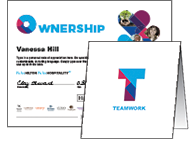 Looking for brand-specific recognition certificates? Choose your brand to download. Choose from multiple brands. 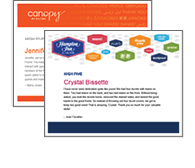 Customize, print, and present.